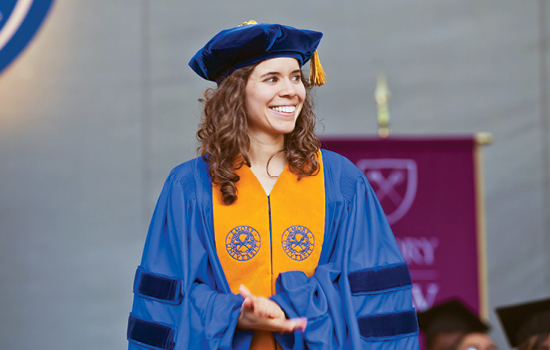 Amanda Garcia-Williams 09MPH 15PhD is the 2015 recipient of Emory's highest student honor, the Marion Luther Brittain Award. This is the first time a Rollins student has won this award, which is presented each year to a graduate who has demonstrated exemplary service to both the university and the greater community. Garcia-Williams, who earned her PhD in behavioral sciences and health education, has dedicated time to Emory Cares 4 U—a campus-wide suicide prevention initiative—in addition to serving on the honorary degree committee; the task force on protest, dissent, and community; the committee on class and labor; and several search committees. Garcia-Williams was accepted into the 2015 class of the Epidemic Intelligence Service (EIS), an elite corps of "disease detectives" who investigate outbreaks and other public health crises at the CDC. While her primary interest remains preventing violence and injury of all kinds, she is open to any assignment by the EIS. "It's my dream job," she says. "I know I'll be happy because I'm passionate about every aspect of public health."